The thing I always share with parents is the fact that no matter how much time we spend on this journey, whether diagnosed last week, or 26 years ago, it makes sense to look back to the beginning and realize just how much we learned. Because whether it is a short time or a long time one thing I know to be true is that no matter how much time passes, we gain knowledge every day. Don’t we? We start with the realization that we have no idea what this disease is and how to handle it to meeting with newly diagnosed parents sharing with them that they too can do what we all have done. The other day I saw a tennis instructor working with a young pupil. A basket full of tennis balls accompanied the teacher. I am not a tennis player and now little about other than what I learned the times I tried it in my youth. This was a new visual for me. Tennis ball after tennis ball after tennis ball went from instructor’s racket over the net to teh student’s racket. 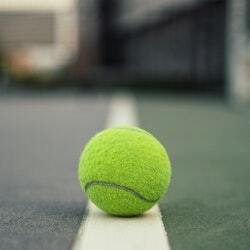 It clearly was a practice they had done hundreds of times because the student knew without a spoken word when to move to different parts of the tennis court, or to use a backhand or or overhead swing. It was fascinating to watch. Hours and hours and tens of thousands of tennis balls……tennis ball after tennis ball after tennis ball, again and again and again. We too do the same thing when it comes to our children and their diabetes management. Again, and again, and again we try, striving for that perfection. Perhaps we need to give ourselves a break sometimes because we are going to be right back it tomorrow, and teh next day until such time that the ‘break’ we wait for and this disease is cured once and for all. But until such time it’s injection after blood check after treating a low after injection after blood check after treating a low after injection after……..